Happy Tuesday, all! I'm reviewing the 88 Neutrals Eyeshadow palette today - a palette that you can get for about $10 off eBay. I purchased this palette a few weeks ago, and I find myself reaching for it almost everytime I go out now. The 88 Neutrals palette has a mixture of shimmery and matte eyeshadows. It has a really large selection of colours. Some colours more or less overlap, though there are some very slight differences. Here's a little look I did using a gorgeous shimmery gold colour and a matte brown colour. It is just a very natural, everyday look. I also used a white shimmery colour to highlight my brow bone and cheekbones. The eyeshadows are really buttery and soft, and the colour payoff is amazing! There is a little fall down from these shadows, but not very much. 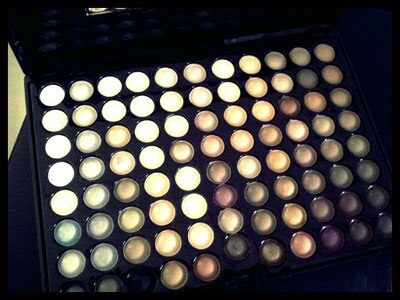 These eyeshadows are pretty intense, and stay on for hours. With a primer, these shadows have lasted me an entire night out, dancing, oily lids, and all. The matte colours from this palette are a little less intense compared to the shimmery colours, so I definitely suggest using a primer with them, whether or not you need it to last for hours. For those wondering, I am using Face of Australia Lip Quench Moisturizing Lipstick SPF 30+ in Sweet Nectar, topped off with SAX Lipgloss in Taupe.